Is Your Teen Suffering from This Sleep Syndrome? It’s a school morning and you go to wake your teen, ultimately forced to vigorously shake your child so he or she won’t be late for school. Reluctantly, your teen wakes up, somehow making it class just shy of 8 am, but doesn’t fully wake up until 2 hours later. The student comes home in the the evening, now fully alert and at their best. 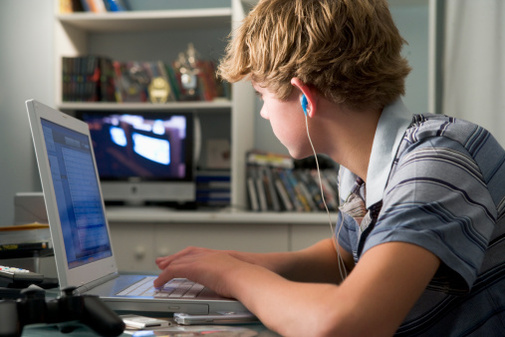 Now energized, your teen begins a full night including social activities on the computer, iPad, cell phone, TV watching and sure. sometimes doing schoolwork. All of which, involving exposure to bright, artificial light. Your teen then finally heads to sleep at 2am the following morning, and around 6am, the cycle begins again. For most teens, this is the typical school week to be endured till they get to the weekend. Now life really begins, going out all night and having a good time till curfew. Saturday and Sunday mornings your teen will sleep till noon, in order to enjoy the late nights. Come Monday morning, especially vigorous shaking is necessary to get your teen up for school. Most of us can remember behaving similarly in our formative teen years. I'll admit that even into my medical school days, the most productive hours of studying in high school and college were in the hours between 10 pm to 2 am. In most cases, people outgrow this habit without lasting adverse consequences. Hormones sent from certain sections of the brain act as signals and set the sleep-wake schedule. This process usually happens in a 24-hour cycle (actually a little over 24-hours). The hormone that signals the brain to sleep is called melatonin. Melatonin is suppressed by light, which is why all those teen activities involving tech instruments that emit light suppress the natural tendency to fall asleep. During the teenage years, there is a natural tendency for this sleep-wake schedule to move forward a bit. Add to that the night activities that involve hours of light exposure and your teen’s behaviors solidify this delayed sleep schedule. How do we measure where our internal schedule is set? There are two ways to measure an internal schedule. Although neither are readily available for precise assessments, they can be estimated. The first is to measure the first time that there’s a rise in the level of melatonin, or Dim light melatonin onset (DLMO). This occurs about two hours before the ideal sleep time. The second is measuring body core temperature. This is a good measure of metabolic activity in the body. The highest reading is usually found in the late afternoon. The lowest reading (known as T minimum or Tmin) usually occurs around 4 to 5 am, about 2 hours before the ideal wake time. Estimating these two measures can help identify sleep-wake problems so treatment is started. What works for teens with Delayed Sleep Phase Syndrome? Forcing a child to go to bed early will not work. Your teen won’t fall asleep because the internal clock is already delayed. Instead, treatment should include a combination of significantly limiting and avoiding activities at night that involve light exposure (what most of us are guilty of doing at night). The Centers for Disease Control has even recommended that schools consider later start times to help be more aligned with a teen's sleep-wake cycle. Taking a melatonin supplement has its value only when dosage and timing is appropriate. As mentioned, bright lights are an effective way to suppress melatonin, which is a way of correcting the sleep schedule and pushing the schedule back to an earlier time. But bright light exposure requires expertise, as you can make the situation worse with poor timing. Finally, regulating weekend sleep and wake times to correlate with the desired weekday sleep and wake times, is also key to resolving this condition. When is the best time to seek help for this condition? In most cases If you’re going to help your teen, he or she needs to accept the change. Ideally, this adjustment process should take place two weeks before the start of the school year. But if done after the school year starts, treatment may involve the use of sunglasses at a certain time in the morning. Your teen may also consider the help of a sleep specialist because I actually believe that there’s value in having the doctor write a note to allow the student to start school one to two hours later, just while we reset the teen’s body clock. Remember, sleep is where the daily earning is solidified. There is a value into seeking a balance in our daily schedule, especially during the learning years of adolescence.